Increasing use of imaging technologies, such as computed tomography (CT) and magnetic resonance imaging (MRI), for aid in diagnosis of other conditions has led to increased diagnosis of adrenal masses. The incidence of these incidentally noted adrenal masses has been estimated to be around 5%. [4, 5, 6, 2, 7] Autopsy studies have supported this estimation, showing the incidence of adrenal masses found at autopsy to also be around 3-5%. [5, 2, 8] Furthermore, studies of hospital discharges showed a 43.4% increase in adrenalectomy rates from 1988 to 2000. [7, 9] With increasing diagnosis and treatment of adrenal masses, optimization of cure and minimization of morbidity is very important. In addition, open adrenalectomy is the treatment of choice for patients in whom laparoscopic surgery is contraindicated. A patient's inability to undergo pneumoperitoneum is an absolute contraindication for laparoscopy. Multiple previous abdominal operations and obesity remain relative contraindications for laparoscopy. In cases of widely metastatic disease with a concomitant adrenal mass, tissue diagnosis should be obtained before the decision is made to proceed with adrenalectomy because primary adrenal carcinoma is rare. The outer layer (cortex) of the gland contributes to homeostasis via its endocrine function, secreting cortisol, aldosterone, and dehydroepiandrosterone (DHEA). These hormones play pivotal roles in regulating salt and water balance, and in the case of DHEA add virilization hormones to the hormonal milieu. The inner layer (adrenal medulla) is derived from neural crest cells and is important in the sympathetic regulation of the body by secreting norepinephrine. There are several known disorders of adrenal metabolism that involve hypersecretion of these different molecules. For more information about the relevant anatomy, see Suprarenal (Adrenal) Gland Anatomy. Before operative intervention, treatment for appropriate coagulopathies and for hormonal excess should be instituted. Serum potassium levels should be corrected in hyperaldosteronism, and hypertension control should be initiated. If cortisol excess is severe, inhibition of cortisol with ketoconazole, mitotane, or metyrapone should be considered. 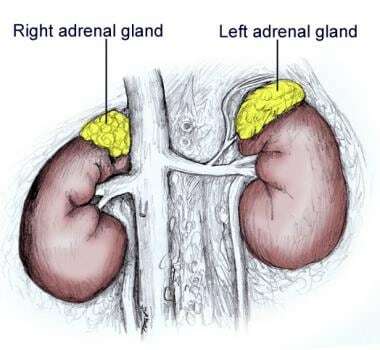 In addition, good glucose control is necessary, and operative replacement of steroids is indicated; the hypothalamic-pituitary-adrenal axis for the normal contralateral adrenal gland will remain suppressed for some time after removal of the abnormal adrenal tissue. For pheochromocytoma, initiation of alpha blockade with either phenoxybenzamine or prazosin is an absolute necessity to protect the patient from the sympathetic surges possible with manipulation of the mass during surgery. For the same purpose, some authors have advocated preoperative use of calcium-channel blockers. In addition, vascular volume reexpansion is often necessary because of volume contraction with hypersympathetic states. The outcomes of open adrenalectomy vary with the pathology of the disease process, and morbidity changes according to the approach chosen. Approaches that limit access to the peritoneum greatly decrease the rates of postoperative ileus; however, vascular control is often difficult. Autorino et al, in a systematic literature review and meta-analysis comprising nine retrospective case-control studies, compared open adrenalectomy (n=557) and laparoscopic adrenalectomy (n=240) with respect to surgical and oncologic outcomes. The laparoscopic procedure was associated with a shorter duration of hospitalization and a higher incidence of peritoneal carcinomatosis, but no significant differences were found in overall recurrence rate, time to recurrence, or cancer-specific mortality. Outcomes for benign lesions, including hormone-secreting lesions, are excellent. Resolution of symptoms is achieved in nearly all patients, except those who have contralateral disease or sites of metastasis (in the case of pheochromocytoma). Bulus H, Uslu HY, Karakoyun R, Koçak S. Comparison of laparoscopic and open adrenalectomy. Acta Chir Belg. 2013 May-Jun. 113(3):203-7. [Medline]. Prager G, Heinz-Peer G, Passler C, Kaczirek K, Schindl M, Scheuba C, et al. Surgical strategy in adrenal masses. Eur J Radiol. 2002 Jan. 41(1):70-7. [Medline]. Gagner M, Lacroix A, Prinz RA, Bolte E, Albala D, Potvin C. Early experience with laparoscopic approach for adrenalectomy. Surgery. 1993 Dec. 114(6):1120-4; discussion 1124-5. [Medline]. Jossart GH, Burpee SE, Gagner M. Surgery of the adrenal glands. Endocrinol Metab Clin North Am. 2000 Mar. 29(1):57-68, viii. [Medline]. Barzon L, Boscaro M. Diagnosis and management of adrenal incidentalomas. J Urol. 2000 Feb. 163(2):398-407. [Medline]. Saunders BD, Wainess RM, Dimick JB, Upchurch GR, Doherty GM, Gauger PG. Trends in utilization of adrenalectomy in the United States: have indications changed?. World J Surg. 2004 Nov. 28(11):1169-75. [Medline]. Gallagher SF, Wahi M, Haines KL, Baksh K, Enriquez J, Lee TM. Trends in adrenalectomy rates, indications, and physician volume: A statewide analysis of 1816 adrenalectomies. Surgery. 2007 Dec. 142(6):1011. [Medline]. Grumbach MM, Biller BM, Braunstein GD, Campbell KK, Carney JA, Godley PA. Management of the clinically inapparent adrenal mass ("incidentaloma"). Ann Intern Med. 2003 Mar 4. 138(5):424-9. [Medline]. Graham DJ, McHenry CR. The adrenal incidentaloma: guidelines for evaluation and recommendations for management. Surg Oncol Clin N Am. 1998 Oct. 7(4):749-64. [Medline]. Itano NB, Blute ML, Spotts B, Zincke H. Outcome of isolated renal cell carcinoma fossa recurrence after nephrectomy. J Urol. 2000 Aug. 164(2):322-5. [Medline]. Ranvier GG, Inabnet WB 3rd. Surgical management of adrenocortical carcinoma. Endocrinol Metab Clin North Am. 2015 Jun. 44 (2):435-52. [Medline]. Thompson GB, Grant CS, van Heerden JA, Schlinkert RT, Young WF Jr, Farley DR. Laparoscopic versus open posterior adrenalectomy: a case-control study of 100 patients. Surgery. 1997 Dec. 122(6):1132-6. [Medline]. Blumenfeld JD, Sealey JE, Schlussel Y, Vaughan ED Jr, Sos TA, Atlas SA. Diagnosis and treatment of primary hyperaldosteronism. Ann Intern Med. 1994 Dec 1. 121(11):877-85. [Medline]. Vassilopoulou-Sellin R, Schultz PN. Adrenocortical carcinoma. Clinical outcome at the end of the 20th century. Cancer. 2001 Sep 1. 92(5):1113-21. [Medline]. Ng L, Libertino JM. Adrenocortical carcinoma: diagnosis, evaluation and treatment. J Urol. 2003 Jan. 169(1):5-11. [Medline]. Lee JE, Berger DH, el-Naggar AK, Hickey RC, Vassilopoulou-Sellin R, Gagel RF. Surgical management, DNA content, and patient survival in adrenal cortical carcinoma. Surgery. 1995 Dec. 118(6):1090-8. [Medline]. Autorino R, Bove P, De Sio M, Miano R, Micali S, Cindolo L, et al. Open Versus Laparoscopic Adrenalectomy for Adrenocortical Carcinoma: A Meta-analysis of Surgical and Oncological Outcomes. Ann Surg Oncol. 2016 Apr. 23 (4):1195-202. [Medline]. Ekici S, Ciancio G. Surgical management of large adrenal masses with or without thrombus extending into the inferior vena cava. J Urol. 2004 Dec. 172(6 Pt 1):2340-3. [Medline]. Barzon L, Scaroni C, Sonino N, Fallo F, Gregianin M, Macri C. Incidentally discovered adrenal tumors: endocrine and scintigraphic correlates. J Clin Endocrinol Metab. 1998 Jan. 83(1):55-62. [Medline]. Copeland PM. The incidentally discovered adrenal mass. Ann Surg. 1984 Jan. 199(1):116-22. [Medline]. Kloos RT, Gross MD, Francis IR, Korobkin M, Shapiro B. Incidentally discovered adrenal masses. Endocr Rev. 1995 Aug. 16(4):460-84. [Medline]. Osella G, Terzolo M, Borretta G, Magro G, Ali A, Piovesan A. Endocrine evaluation of incidentally discovered adrenal masses (incidentalomas). J Clin Endocrinol Metab. 1994 Dec. 79(6):1532-9. [Medline]. Ross NS, Aron DC. Hormonal evaluation of the patient with an incidentally discovered adrenal mass. N Engl J Med. 1990 Nov 15. 323(20):1401-5. [Medline]. Wein AJ, Kavoussi LR, Novick AC et al. Campbell-Walsh Urology. Philadelphia: Saunders, Elsevier; 2007. 1868-1888.